In case you are unfamiliar with futon and curious about its origins, it can be best described as a form of Japanese bedding. You should not confuse it with a typical bed because it generally just includes a mattress and a duvet. It also differs in that it can be folded and stored. Its flexibility makes it quite useful for small spaces and for setting up a guest room. Rather than considering an air mattress or a sofa bed, why not consider getting a Japanese futon for your space? Even if you did decide on a futon, the next step is deciding on the best Japanese futon. Despite its practicality and flexibility, if you own a futon, because of its material, you must maintain it regularly by placing it under the sun. The process of airing it is necessary to prevent it from getting mites. Nonetheless, you should not confuse a Japanese futon with a Western one. Western futons differ from the Japanese-styled ones in that they tend to be folded into a sofa, which is very similar to a sofa bed. These futons are too thick to fold and are set up in such a way that they do not require airing. With that said, if you want a traditional futon, then this article will guide you in choosing the best Japanese futon. Please note that the Futon is vacuum sealed at the time of delivery. When the Package is opened, the Futon Set will be expanded back to the normal size. The Emoor Japanese Tradition Futon Mattress is available for purchase in several sizes, namely twin, twin-short, full, full-short, queen, California queen, and king-short. The futon can also be purchased in a set that comes in different colors. The Japanese craftsmen who made this product used 100% hygroscopic cotton. It was sewn with 200 thread counts using cotton broadcloth for its outer layer. 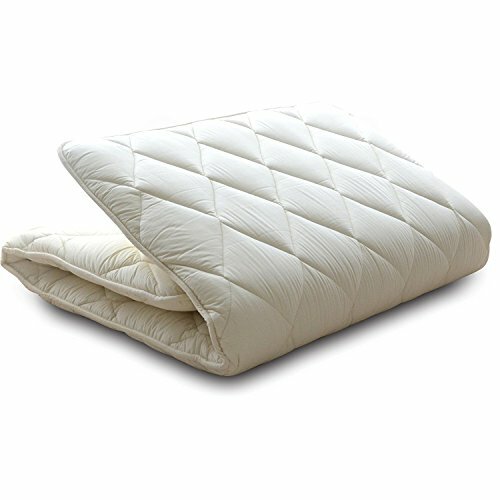 Inside, the stuffing is made up of two layers of pure, deodorized polyester material with 50 % Teijin Mightytop(R) ll Eco, giving it a total weight of 12.3 pounds. This mattress was carefully made and crafted to give you the quality that is expected of a Japanese mattress. The pleasant smell is designed to last for two or three years. Not thick enough: Sleeping on this futon may give you the impression that you are sleeping on a thick sleeping bag. Painful sleep: If you are not used to sleeping on futons, then you should probably gradually wean yourself off of a typical bed's mattress before attempting to sleep on this futon. Failure to do so may result in a painful sleep. Misleading sizes: A full-size mattress that is advertised the company might actually be a twin sized mattress. Hence, you should read the mattress dimensions before placing an order. The Fuli Japanese Futon is available for purchase in two sizes, which are full and twin, and has a total approximate weight of 15 pounds or 12 pounds, respectively. It also comes in different colors like beige, black, blue, brown, gray, green, and pink. Its external covering is made of pure hygroscopic cotton wherein 205 thread counts have been used to sew it together. On the other hand, the three-layered internal stuffing is made of 4.6 pounds, deodorized, 100% polyester that contains 50% Teijin Mightytop(R) ll Eco. Interestingly, this was made by Japanese craftsmen and according to the standards that are expected of a futon. Not standard American sizes: If you intend to use this over your mattress, it might be a bit larger or smaller as compared to this futon. As such, measuring your mattress is advisable prior to buying. Thin mattress: Despite claims of three layers, this mattress might still be very thin for others, and probably will not give you the most comfortable sleep, especially if you have never slept on a futon before. 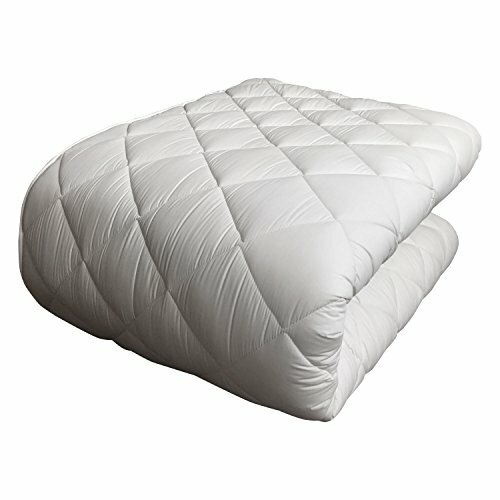 Loses its fluff: After repeatedly rolling up the futon, it may thin out in some places and you may realize that it may have a bit of a hollowed middle. Thus, You should always practice proper care of your futon to ensure that it maintains its intended shape and feel. 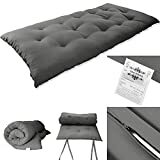 Limited size choices: Since you cannot buy this futon in larger sizes, you might need to buy more if you are fond of accommodating a lot of visitors. The Magshion mattress is a convenient sleeping arrangement especially if you are planning a sleepover. This product is manufactured in the USA. It has an external covering that is made of 100% polyester, while the stuffing is composed of cotton batting wherein the middle layer is loaded with foam that is 0.5 inches thick. This has a thickness of three inches, a width of 27 inches, and a length of 80 inches, and comes in a dark gray color. In addition, this also has a zipper on the side as well as a tie. Limited options: This product is only available in a single size and color. Flat mattress: It might not be thick enough for your needs and if you are not accustomed to it, it may cause back pains. No anti-bacterial or anti-mite properties: Considerable spot cleaning methods should be done on this product to ensure that no mites or bacteria thrives in it. You were presented with a variety of options, and none are perfect. However, if you like the futons discussed here, then you ought to consider getting either the Emoor or FULI futons for two reasons. Firstly, they are available in different sizes. Secondly, they are authentic Japanese futons. They are very similar in terms of their pros and their cons. Hence, if you are having a difficult time deciding, you can base your decision on the price. Either futon will be a good choice. However, if you want a smaller and versatile futon, then you should get the Magshion Mat.